South Dakota Dairy Queen's crush Miracle Treat Day, again! 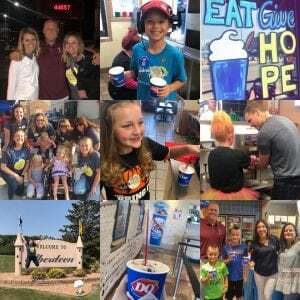 – Dairy Queen Corp.
South Dakota Dairy Queen's crush Miracle Treat Day, again! > Dairy Queen of Madison SD sold nearly 4,000 Blizzards MORE than last year, with a grand total of 44,657! > Dairy Queen-Pierre kicked off their first Miracle Treat Day with a grand total of 6,620 Blizzards (crushing their goal of 5,000)! > Sioux Falls Mayor Paul TenHaken was a Blizzard making machine at Dairy Queen – Minnesota Ave. Sioux Falls. > Dairy Queen – Aberdeen, SD hit their goal of selling more than 7,000 balloon icons and more than 4,800 Blizzards! > Two Sioux Falls Dairy Queen locations: Minnesota Ave. and 57th & Western both sold over 11,000 Blizzards for the kids! Wow! > Dairy Queen – Vermillion, SD had a grand total of 6,846 balloon icons and Blizzards sold! > Local DQs pulled out all the stops for extra family fun including: bouncy houses, petting zoos, rowing competitions, face painting, balloon animals, live music, photo booths, costume contests and so much more! > Local media came out in full support and the message of miracles took over the airwaves. > Your CMN team put on nearly 1,000 miles to show our endless love for DQ. > Thousands of smiles were captured across the region, especially on the faces of our sweet miracles themselves! Next post: Dairy Queen locations share Miracle Treat Day with Cincinnati Children’s Champions!